Home » What if we trained teachers like we train doctors? What if we trained teachers like we train doctors? What if, during the first year of your residency, you were encouraged to substitute teach, helping fund your education and reducing the school district’s substitute shortage? And during the second year, what if the district paid you a stipend for teaching full time in a classroom, where you could immediately apply what you’re learning in courses? Finally, what if your residency potentially puts you at the front of the line for teaching jobs in the district? A newly-launched, graduate program is doing all of this, and more. Now entering its second year, Oregon State’s immersive Master of Arts in Teaching (MAT) in Clinically Based Elementary Education is a partnership between the College of Education and one of Oregon’s largest and most diverse public school districts: Beaverton. Just outside of Portland, the district has 2,300 teachers, 53 schools and 41,000 students — half of whom are minorities from homes where 101 different primary languages are spoken. Graduate students in the new program are mentored by experienced Beaverton educators, called clinical teachers. The first-year students are known as practicum teachers and hone their skills in the classroom two days a week. When not teaching, they take online and hybrid courses and can work as paid substitute teachers within the district under a restricted license. Second-year students, called resident teachers, dive in deeper. They teach five days a week while taking classes and earning a 0.4 FTE stipend paid by the district. During the second year, the clinical teachers split their time between two different classrooms, each run by a resident teacher. “This is super immersive learning — from the first day of the year, the grad students are introduced as teachers, not as student teachers,” says Nell O’Malley, a senior instructor who helped launch the program and serves as director of education licensure at the College of Education. The graduate students are not the only beneficiaries of the new program. “Our partnership with Oregon State not only allows grad students to learn from our master teachers and apply what they’re learning in their OSU courses the very next day, but our teachers and staff also get exposure to the latest educational research,” says Sue Robertson, the chief human resource officer at the Beaverton School District. 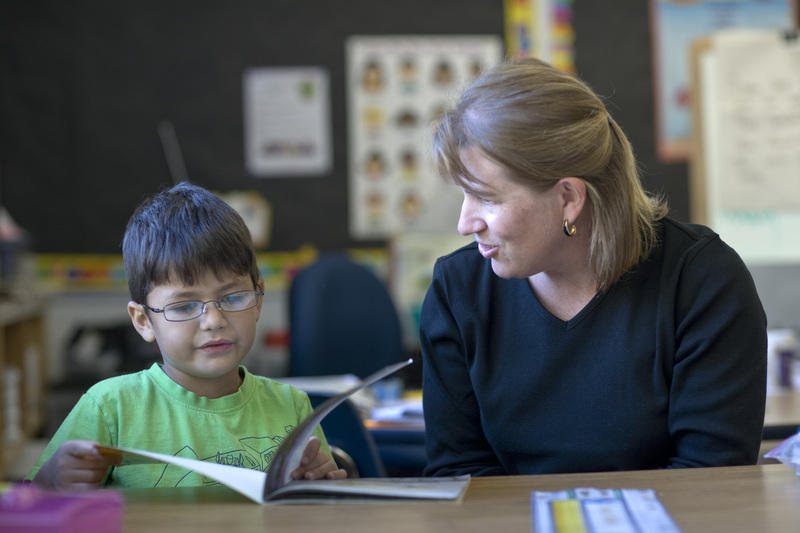 Clinical teachers get quality help with teaching loads, and the district gains access to good substitute teachers, who are in short supply nationwide. And because the grad students are in the same school for two full years, the school’s entire staff and students benefit. Studies show that more than 40 percent of new teachers leave the profession within three years, often because they are not prepared for real-world challenges ranging from socioeconomics, to special needs, to language barriers. Matt Nyman, the Oregon State instructor who coordinates the MAT program, believes it will have a significant impact on teacher retention rates. Although there are other immersion-type teacher education programs in the U.S., the sustainable funding model of the Oregon State program sets it apart. “Having students in classrooms as substitute teachers during the first year, and then as part-time employees the second year — now that is very different,” O’Malley says. Robertson has worked closely with the teachers’ union, and so far, the MAT program is proving to be a good fit. Another distinguishing feature is that everyone gets a say in which graduate students are accepted into the program and which clinical teachers get to work with them. Although it has been just a year, all parties are committed, flexible and looking forward to the second year.